I don't remember picking this book up at all, but it probably ended up on my shelf because of the intriguing subject matter. I've not read anything by the Marquis de Sade, but he has enough of a reputation that I was interested to get a taste of what he and his work were like, without necessarily committing to reading titles of his that are more than a little intimidating. De Sade's Valet follows the life of a man names Latour, who is born physiologically incapable of feeling pain. Obsessed with finding out how pain works and why he alone seems exempt from the sensation, he immerses himself in the world of the human body and dissections, eventually becoming the close accomplice to the Marquis de Sade. Honestly, I had kind of expected to finish De Sade's Valet with at least some emotional impression, but apparently not. Considering the salacious subject matter, I would have at least expected to be either outraged or morbidly intrigued, but having finished the novel, it succeeded in leaving absolutely no impression whatsoever. I can't actually believe that a novel where the Marquis de Sade, a historical figure with an infamous reputation for cruelty and unusual sexual proclivities, is a main character can actually be so nondescript. I am almost impressed at this level of incompetence. I think the main problem that De Sade's Valet has is that of tone combined with writing style. Everything is uniformly ugly, from the people to the scenery to the events of the novel itself. There are moments of high drama with arrests and murder, but the writing style is so understated that they don't register as particularly dramatic or even notable. I would call it beige prose, but there is a startling amount of description so it doesn't quite fit the definition. Hell, I made it clear that I did not like Victims by Shaun Hutson, but in comparison to this it seems like a goddamn masterpiece. At least Hutson managed to evoke something, even if it was my everlasting disgust. With De Sade's Valet? What I got here was the literary equivalent of river sludge: unpalatable, but not especially interesting. It's really disappointing. 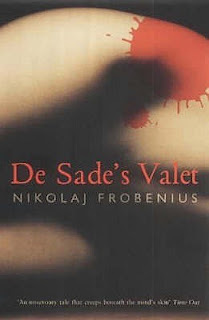 Frobenius has an interesting topic here, with the Marquis de Sade and the desire to experience a sensation that you cannot physiologically experience, but he wastes it. The scenes of murder, dissection and orgies aren't described in enough detail to make them interesting and the characters aren't crafted well enough to save the understated prose. It is a novel that more or less fails on every level and leaves absolutely nothing in its wake.